Shortly after market opening on Tuesday morning, Dow Jones' Newswires – the news service best known for publishing market statistics on the Dow Jones ticker where it announces news from the financial sector – published a series of fake headlines, raising concerns that it had been hacked. 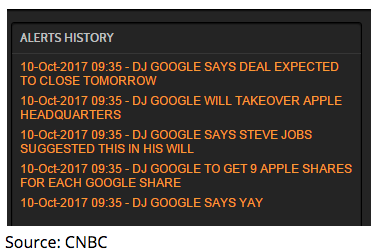 Such headlines published that morning included: "DJ Google to buy Apple for $9 billion", "DJ UPDATE: Google, Apple Join to Create Tech Giant", "DJ Google Says Steve Jobs Suggested this in His Will." and "DJ Google Says Yay". Dow Jones' Senior Director of Communications, Steve Severinghaus, blamed a "technical error" for the erroneous publishings later on Tuesday. Severinghaus' press release stated, "Please disregard the headlines that ran on Dow Jones Newswires between 9:34am ET and 9:36am ET. Due to a technical error, the headlines were published. All of those headlines are being removed from the wires,". As Apple Inc. has a market capitalization of almost USD$800 billion, it's likely that any bid would be rejected. Furthermore, Google would never have been the bidder, as its parent company, Alphabet would be the one that facilitates any takeover bids. How Did This News Impact the Markets? Although the news was removed after just two minutes, it managed to raise the value of Apple shares for a short time. The chart above clearly shows the spike. On October 10, the price closed at 155.72 During the next day it spiked up, going through the 156.00 resistance, reaching 156.95 and then finally closed higher than the previous day at 156.45. Afterwards saw a period of 'buying the dip', as you can also clearly see. So, What Caused This to Happen? Many who were following this news would be forgiven for thinking, even for a second, that the Dow Jones had been hacked. However, Severinghauss moved to dismiss this news quickly, stating, "We absolutely were not hacked." According to Forbes.com as the 2013 AP Twitter hack shows, the high frequency trading systems designed by investment firms often comb through social media to analyse millions of tweets from news and industry leaders to gauge market sentiment. They use machine learning to try and weed out unreliable sources. However, these systems are not perfect and can still fall victim to the same misinformation as us humans. 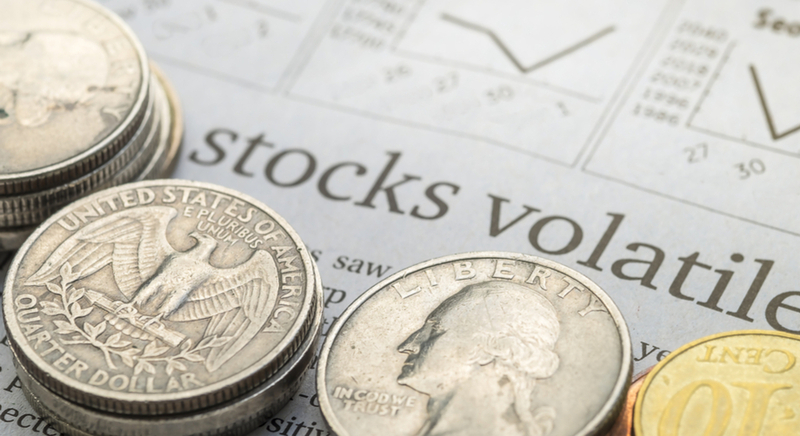 Financial news can be used as pump-and-dump action for penny stocks. In 2014, investors noticed that Cynk Technology – which trades over the counter at four cents a share currently – had jumped in value by over 25,000%, without producing any revenue or having any employees. At one point, shares were topping $20 and the company had a $6 billion market cap. Its market cap today is $11.6 million. For some traders this can be extremely profitable, but for others it's also, very very risky too. Don't forget to keep your eyes on news coming from the wider industry. Events like this show that even with fake news, there might be an opportunity to make some return on your investment, if you are positioned on the right side of the market. Remember, with Admiral Markets, you can trade share CFDs in Google (GOOG) and Apple (AAPL), and also the Dow Jones Industrial Average (DJI30), as well as those of many other household company names. 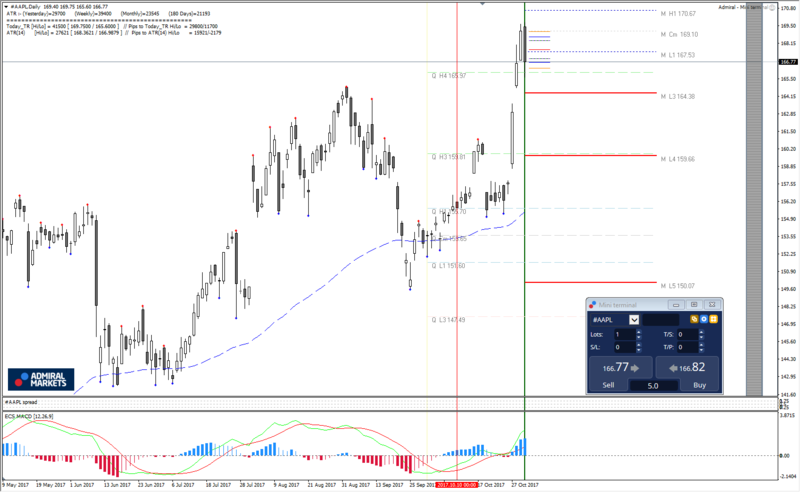 Check out our full share CFD offering. Trading carries high risk and isn't suitable for all investors, so before you start, please ensure you understand the risks involved. We also encourage you to download and practise your trading strategies in a risk-free environment, on a free Demo account with virtual funds. It's a great opportunity to give trading a try without risking any of your capital. Looking for something else? Well, Admiral Markets also offers trading in Forex and CFDs on stock indices, commodities, bonds and also cryptocurrencies! Check out our full product offering and conditions today!